This is a high quality handbound book. I constructed this book by hand tearing pages to sew in a case binding. 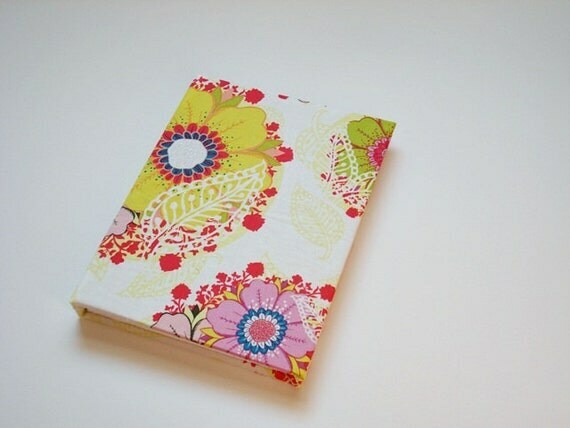 The covers are made of bookboard covered in decorative multicolored fabric in yellow, white, pink, red & teal . Just inside the covers are teal fly sheets. The pages are made of Mohawk Superfine Text Weight paper & were hand-torn one at a time. This paper is made in the USA & is white in color. Great for a variety of uses! This book contains 48 sheets, so a total of 96 pages (including front & back). The size of the book is approximately 6.75 inches by 5.15 inches & about .6 inches thick at the binding.